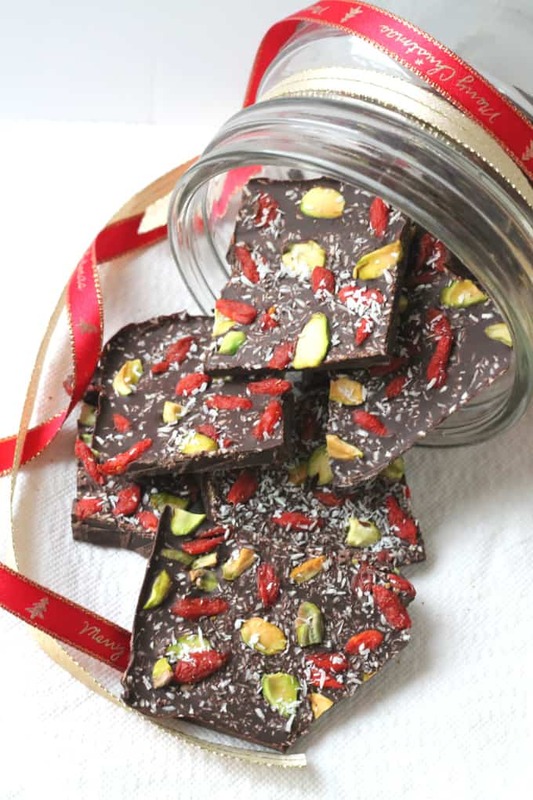 An indulgent yet healthy Christmas treat of dark chocolate topped with goji berries, pistachios and coconut. The decorations and lights are going up in our towns and everyone I know has already made some inroads into their shopping….so is it acceptable to start posting Christmas recipes yet?! Of course it is. There’s nothing wrong with a little forward planning when it comes to the festive season! But as much fun as Christmas is, it can also be a very expensive for most families. Along with the presents and toys we can get caught up in buying mountains of foods, much of which will end up going to waste. 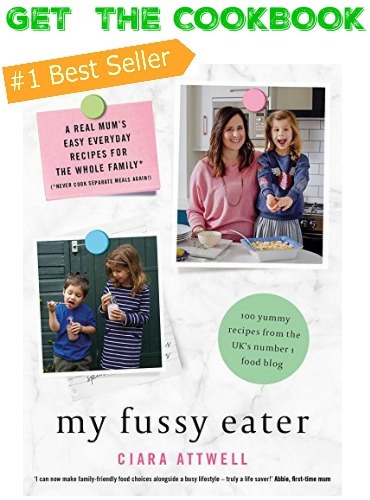 As part of their Live Well For Less campaign, Sainsbury’s have asked us food bloggers to come up with ideas for using up leftover ingredients. 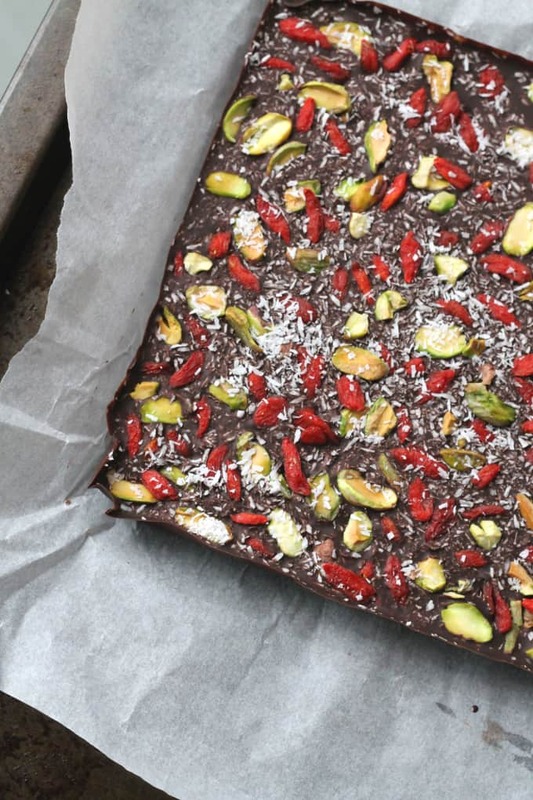 I chose chocolate as I always seem to have half used bars of chocolate in my cupboard and I decided to make a Superfood Chocolate Bark. 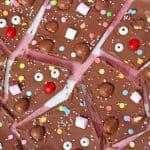 Chocolate Bark is one of my favourite things to make at Christmas. You can add so many different toppings to it and looks impressive enough to pull out when you have guests visiting. It also makes a great edible gift, simply package it up nicely in a jar or a box and finish with some Christmas ribbon. This year I’ve decided to make my bark “super”. I already know December is going to be a month long indulgence so I might as well try to sneak in some goodness where I can. 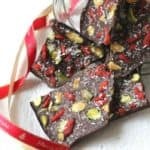 I used goji berries, pistachio nuts and desiccated coconut in my recipe and the chocolate is 70% cocoa, packing this treat full of antioxidents to keep us happy and healthy for the festive period! 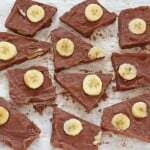 Do you have more ideas on how to use up leftover chocolate? I’d love to hear them. Line a dish with baking parchment. I used an 8x8in dish but you can use a smaller or bigger one depending on how thick or thin you want your bark to be. 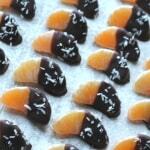 Place in the fridge for 30 minutes or until the chocolate has set. **DISCLAIMER** I was asked by Sainsbury’s to create a recipe for inclusion in their Christmas Leftovers roundup and was compensated for my time spent doing so. So beautiful I make this year round and not just for Christmas and makes a really thoughtful gift. Great idea. Do you use dried goji berries? Do you soak them or anything before adding to the mixture? Yes I use dried and no I don’t soak them! Looks AMAZING. I get a little queezy when I eat some types of goji berries. I think there is a wide range of quality with most superfoods, try and find some high quality goji berries for something like this, worth spending a little more for the best. Absolutely Martin. I totally agree! Thanks Mel. It would certainly make a great edible gift! 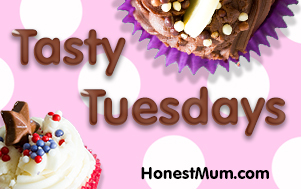 Hi Ciara, I just wanted to let you know about a new monthly linky that I’ve just set up. The theme this month is christmas and new year (it changes each month). I’d love it if you’d come and join in. 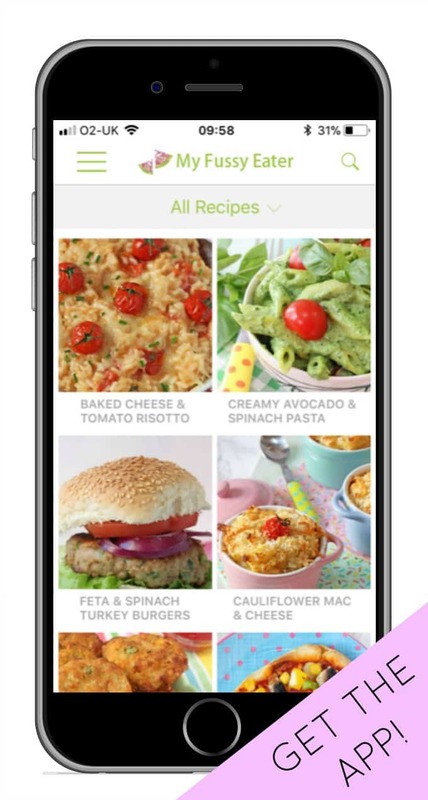 It’s at myrecipebook.co.uk/news/fbc-whats-on-December-2014/ if you’d like to take a look. Thanks Charlotte I will definitely check it out! My pleasure! 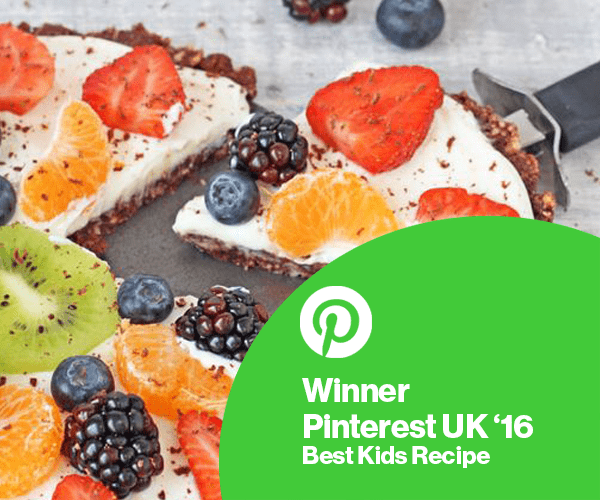 I love the idea of the Christmas recipe link up. Oh wow you have some great ideas for using up chocolate. I keep meaning to try some in a chilli. Its supposed to be amazing! This is so pretty and would make a great gift. Yes, packaged up nice and pretty it would be a lovely gift! Thanks Rebecca I hope you enjoy it! Thanks Megan. I’m all about sneaking in some goodness to my treats!! Thank you. It’s definitely worth trying! Looks delicious! Peppermint bark is on my to do list for Christmas. There’s never any leftover chocolate in this house though! Lol! That’s what everyone is saying to me. I think I just buy so much of the stuff I always have half used bars in the cupboard! What? Left over chocolate??!! That certainly doesn’t exist in this house!! Looks like a yummy bark though! Ha ha! I think I just buy too much! 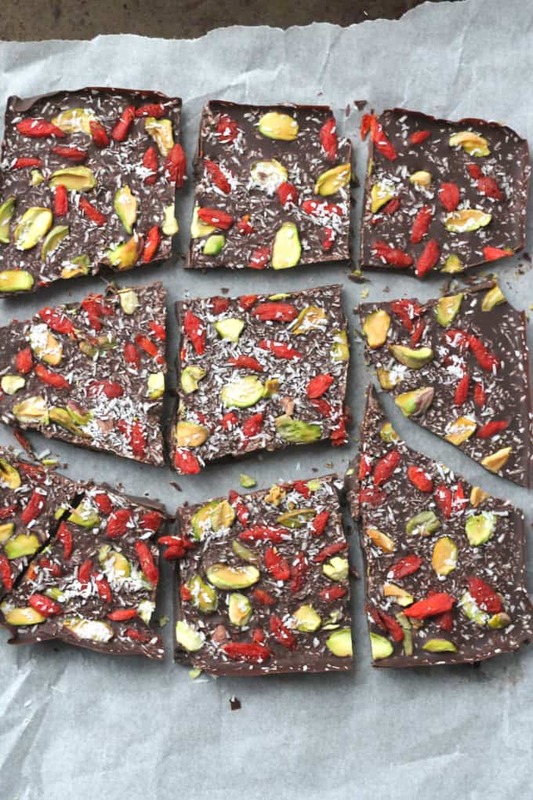 This chocolate bark is so pretty and I love that it’s so simple to make AND it’s rocking some awesome super-foods 🙂 Pinned! I’ve not seen you writing for sainsbury’s before, have you just joined their bloggers network? That’s why I use high % cocoa chocolate. Its healthy but I can’t eat a whole lot of it!! 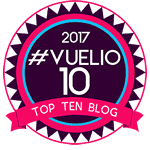 I joined their bloggers network a few months ago and have a done a few posts for them since then.